Considering that I have a serious sweet tooth, it is pretty funny that I actually do not really like honey. I have more of an affinity towards it now than I did as a child, but I still do not really love the stuff. During Rosh Hashanah dinner as all my friends and family were pouring gobs of honey all over their apples I would dab the smallest ritualistic amount on my apple. Actually, I still do that to this day. For the most part, I find the taste to be really floral and overpowering. Being that I feel this way, most people would be surprised that I use honey all the time. Honey is actually rich in antioxidants and can be a great natural sweetener. For me the trick is to use enough for what I am making to be sweet, but not really taste too much like honey. I often drizzle it over plain yogurt (which really needs a bit of sweetness) with fruit and granola. I use a bit of it to sweeten my tea and will often substitute it for sugar in baking. 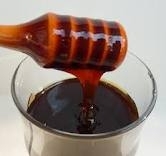 I also really like to use it in vinaigrettes as I find it gives a nice thickness to the dressing. The one exception to my rule is buckwheat honey. I love this stuff! It is very rich in antioxidants and has an earthy, almost molasses taste. In fact, it tastes nothing like the traditional honey which is probably why I like it so much. It is so dark and rich that it actually looks like chocolate syrup. It can be difficult to find as it is not available in all grocery stores. You can normally find it in a health food store (I buy mine at Whole Foods) or it is easily found online. Trust me when I tell you it is worth it! There are pleanty of honeys in your regular grocery store for a reasonable price. There is clover honey, wildflower honey, orange blossom honey to name a few. The type is named for the nectar that the bees were drinking when they produced the honey. Honey is the star of my Stewed Apples A La Mode Drizzled with Buckwheat Honey. It is a great dessert for any time of the year and nicely highlights the use of honey as a natural sweetener and buckwheat honey as a delicious garnish. For all of you who will be celebrating the holiday of Rosh Hashanah and dipping your apples in honey next week, I wish you a happy, sweet and prosperous new year! L’shana Tova! 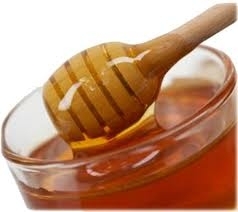 This month the kosher link up ingredient is honey (see below). So, I am presenting a recipe that features not one, but two types of honey – run of the mill clover honey (or use whatever your favorite is)and buckwheat honey. To be perfectly honest, when I learned of this month’s ingredient I was not surprised as Rosh Hashanah is around the corner, the holiday of apples and honey. However I was not that excited in that I am not a huge fan of honey and do not use it in many of my recipes. There is one exception – buckwheat honey. I love this dark and rich honey that actually tastes nothing like the honey most people buy at the store. It is not available in all supermarkets so you may have to get it from a health food store (I buy mine at Whole Foods) or order it online. It is worth it! It actually looks like chocolate syrup and is decadent and rich. I knew right away I would have to come up with a recipe that featured buckwheat honey and this creation was born. A nice thing about this dish is that it is pretty easy to make. The hardest part is peeling the apples, and truthfully if you can’t be bothered just skip this step and leave the peels on. I sweeten the apple mixture with clover honey which is readily available at any grocery store and inexpensive. I like to use honey as opposed to sugar when possible as it has antioxidants and can add some body to what you are making. The recipe is a relatively healthy dessert as its base is fruit and there is no butter, margarine or oil in it. So feel free to eat a lot of it! Although I make the recipe with apples it can be made with any type of fruit. I bet it would be great with peaches, pears or plums. I am serving it with vanilla ice cream but it can be served with frozen yogurt, tofuti ice cream or without to make it a non-dairy pareve dessert. It is very easy to double or triple the recipe to make it for a crowd. By the way, your house will smell amazing when you make it. I think it is the perfect fall recipe! Peel and core the apples. Place into a medium sized pot and immediately pour over the juice of the lemon to prevent browning. Drizzle with the clover honey and sprinkle with the cinnamon and a pinch of salt (trust me on the salt). Add the raisins and walnuts. Pour the water over the mixture and heat over a medium temperature. Once the liquid comes to a boil lower the heat to medium-low and cook uncovered for another ten minutes. Allow the apples to cool slightly. Place apples into a bowl, pour over the juice, raisins and walnuts. Top with ice cream or frozen yogurt and drizzle with buckwheat honey.